Replacement:WRL-10663. The new version is being built with a surface mount headphone jack. This page is for reference only. 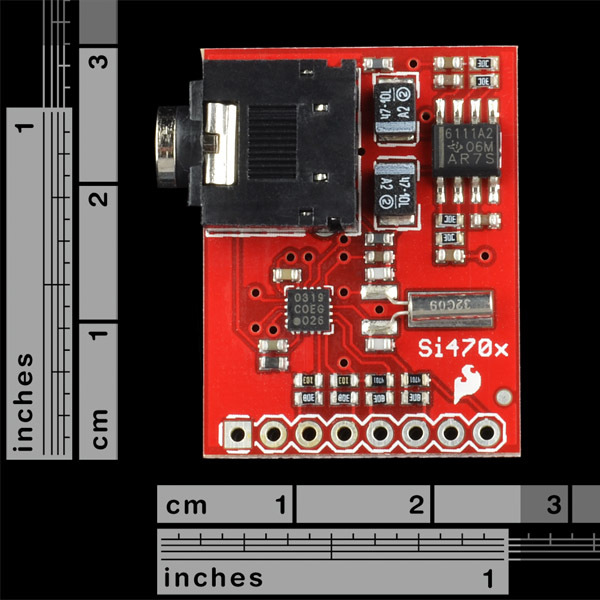 This is an evaluation board for the Silicon Laboratories Si4703 FM tuner chip includes an amp and a headphone jack, and that's everything you need to get up and running! Beyond being a simple FM radio, the Si4703 is also capable of detecting and processing both Radio Data Service (RDS) and Radio Broadcast Data Service (RBDS) information. The Si4703 even does a very good job of filtering and carrier detection. It also enables data such as the station ID and song name to be displayed to the user. The LO is a VCO internal to the chip. The IF is only 128KHz, so I doubt the VCO can tune much outside what is needed for the FM broadcast band. Also, the prescaler has a limited range centered on 32KHz. Aside from that, this is wideband FM only, the average repeater wouldn't sound too great. 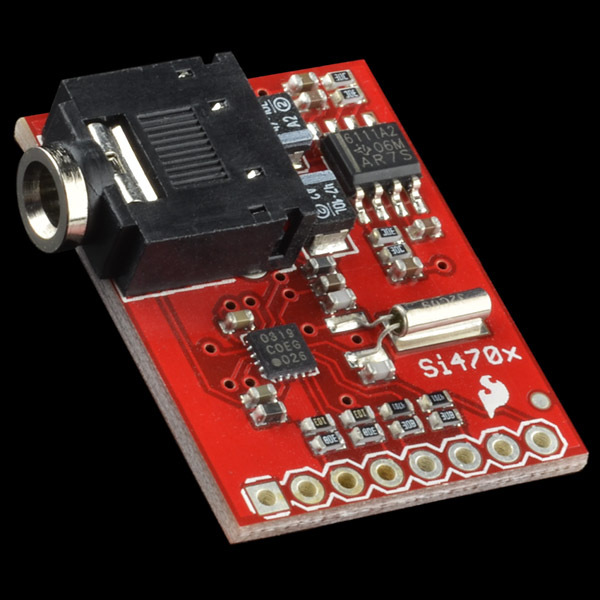 If you want to try to bend something, start with the Si4707 Weather Band chip, that's at least close in frequency and is narrowband FM. May 2011 QST has an article on a 2M fox transmitter based on a 144MHz transmitter chip, maybe you can contact that vendor to see if they are going to build a matching receiver. This + ClocKit = Epic win! Make your own clock radio! that is exactly what i've thought when i saw this. Once you see the antennas for SW vs. using headphones, you'll see why we wanted to have two separate products. This is great! I very much appreciate the board. I actually was waiting for a breakout board for the SI4735-C40-GU chip (http://www.sparkfun.com/products/10227). This has AM, SW, and LW in addition to FM. Nate, any chance of getting one??? I agree! There's talk of a shield/breakout board for the more complex IC. I pushed faster for this one because we needed an FM receiver replacement. We'll try to get the other, fancier products up soon. Nate any idea when you'll have these back in stock or when you'll have a shield/breakout board for the more complex IC? IDK, maybe you found it already, but I hope it helps. i not able to read a ps text of rds....any help?? 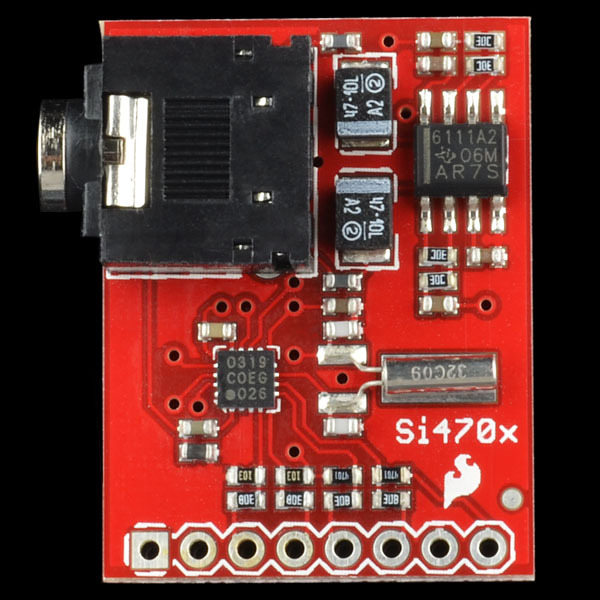 I want to interface the Si4703 FM Tuner with an arduino R3. Can I use the code available? It's crucial to shift the i2c levels to 3.3 V in order to be able to communicate with the tuner? I have a question on this. I'm looking at possibly using a Raspberry Pi Computer to make a double din car stereo, and was wondering if there is any way to hook up the car's antenna to this little guy. I'd like to replace my current radio with a custom made media player so I can have video, radio, and internet all built into my car. On the point of supply voltage. DO NOT CONNECT Vcc to 5V. Several people have reported destruction of the device if you do this. This is not recommended, but I have used mine fine by leaving IO pin levels at Ardunio 5V, without any level conversion, but powering the breakout board at 3.3V from the Arduino's 3.3V connection. It didn't break mine, but that doesn't mean it won't break yours. So don't blame me if it kills it! Is there any change in the code between 5 V and 3.3 V's arduino? I have wrapped up the code that comes with this FM receiver from Sparkfun into a library. I also took the opportunity to tidy things up a bit and fix the RDS. I managed to get the radio text scrolling on the serial connection using Nate's code and some minor modifications. I have uploaded the code here. Feel free to use it however you want. There is no error checking, so there will be errors depending on the signal strength. You can also scroll the raw hex using option 7 now, so you can see what is going on. Great job siren. Really nice that you got this to work. I have been looking for sometime and trying my self to do what you have done. Thanks very much for posting the code. I am having a few issues with my breakout board. The first issue has to do with the Si4703 FM Tuner and the Arduino not powering up correctly. I think it has something to do with ground because if I wiggle the USB connector and hit reset it'll work. Even if I try to re-upload the sketch it still won't power up. I know it's not Arduino Uno because I don't experience that problem with any of my other projects. The second problem that I am have is I get audio pop when I first power up the Arudino. Is anyone else experiencing these issues? I get a small pop when the chip is first enabled, but before I've configured it (channel, volume etc). Read the datasheet for the required delays between chip enable, radio enable, and initial user settings. Are you experiencing the other issue with having to wiggle the USB power connector? And as far as the pop noise goes, I think it's caused by the amplifier (TPA6111A2). I took a quick look at the datasheet and it mentions something about the amplifier having pop reduction and there is a section about MIDRAIL BYPASS CAPACITOR on page 16. Apparently that pop noise is common with most amplifiers and normally all you have to do is delay when the amplifier comes on, but how do you do that with this breakout board? I'm using a Parallax Basic Stamp, so I can't help with the Arduino. C9 on the breakout board is the bypass cap. The pop on mine is barely audible, I only notice it because I run the output to a pair of amplified computer speakers and not a headphone. Make sure all of the voltages at the breakout board are 3.3V max, including the pullups on the I2C bus. Make sure the RST pin is held high after your startup routine (there's a mistake on the Sparkfun schematic that says to pull RST low to enable). Thanks for producing the breakout board. I've gone through about 5 of the standalone chips and burned most of the pads off the package. Are there plans to do a breakout board for the FM transceiver version? A little larger board with holes for standoffs would be great! Thanks again. This board sells very well. Would be nice to see more comments (with links) from people who have been able to get more from the RDS side of the chip. I have found the best way to understand more of what is happening is to output the data in hex. The look at the specs for the RDS data format. I've not been able to get a clear grasp of the "addressing" of the text that is output. 3.3V only. I am using a 3.3V arduino. Thanks. I realise that my level shifting with a 4050 won't work as i2c is bidirectional. I guess I need to find some way of level shifting i2c first. Has anyone gotten RDS to work? I was able to download all the documents for the SI47XX from the silabs website. The liked file includes sample code. I'm not sure it's raw RDS data because it sometimes displays actual station information. On another note, I found the FM Radio Arduino Shield from curious inventor. It uses the i4701 FM tuner chip. I'm pretty sure it basically the same thing, however, I believe the code is written for three-wire control, where as sparkfun's code is written for two-wire control. I'm trying to figure out how to wire sparkfun's breakout board for three-wire because the curuious inventor's code has a class, which looks a lot easier to work with. Well it's, from what I can tell, raw in the sense that the station call sign comes over "in the clear" in one line but the song title "fills in" over several seconds and you have to piece it together your self with your software with this chip. If you look at the code from curiousinventor he is doing the same as far as I can tell. Any luck getting it to work? What would be the most appropriate way of using a separate antenna and audio amplifier with this breakout board? Would it work reasonably well if I just hooked them up to the jack? I also would like to know about hooking up a separate antenna and audio amplifier. The antenna connection is Pin 2 of the SI4703. It is connected to the shield (ground) of the headphones via C5. This keeps the low frequency audio out of the chip. You would need to cut the trace between C5 and L1 and solder the antenna wire to the free end of C5. Keep C5 between the antenna and the chip. Using the example sketch, everything works great except for RDS. At first I thought it was because of the length of the cable, but that's not it because when I display the status it says RDS is available for that station. However, when I poll for RDS I get bunch of scrolling text, but nothing legible. Any chance we could have a breakout board for some DAB digital radio modules such as the Frontier Silicon Venice 7? I've never been so happy in my entire life as I am right now. Excellent work, folks! Nice!!! the price is also great!! great job people! Wish I'd known about this yesterday when I placed an order! 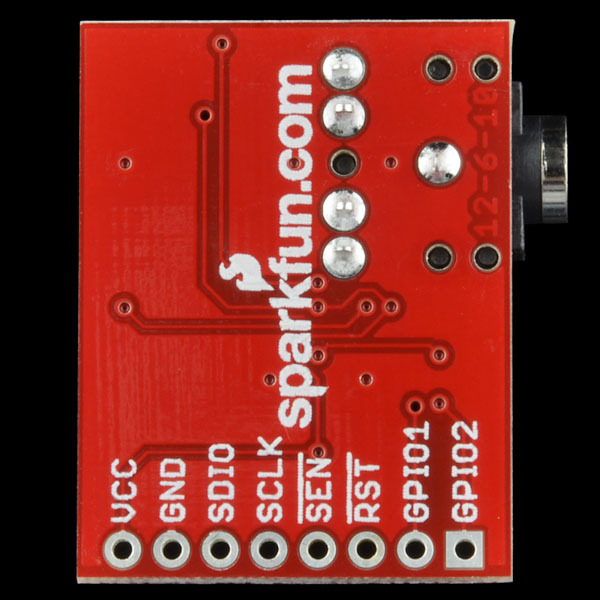 this is the most awesome release from sparkfun. thank you very much! Yeah, this is epic. If only the digital radio chips didn't cost so damn much. FCC was asleep at the wheel when they made a proprietary technology the digital radio standard. Oh, they weren't asleep. I'm sure there were significant "campaign contributions" exchanged. Thanks! I was pretty impressed with the reception of the IC once we got it working. This IC is 'known' to the production crew as being fairly evil but I think we've got yields up pretty well.